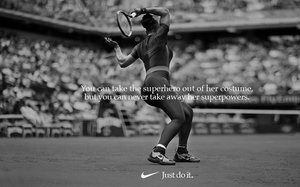 Serena Williams has never been anything less than an astonishingly powerful athlete, making her one of Nike’s most potent marketing weapons. In addition to her early wins at the U.S. Open this year, she also scored an epic triumph against the sexist tennis establishment, in tweets and tutus. Williams, who is about to face off against her sister Venus, was singled out recently by the French Tennis Federation for wearing a Nike-designed catsuit during the French Open. The group denounced her look as unladylike and instituted a new dress code. “One must respect the game,” officials said. Twitter went wild. Tennis fans pointed out that Williams, the world’s top-earning female athlete, pretty much is the game. Fashionistas thought the catsuit was cute, and “Black Panther” fans loved that Williams said it made her feel like a warrior from Wakanda. Health experts applauded the compression fabric it was made from, since Williams had had a close call with blood clots following the birth of her daughter nearly a year ago. And new moms everywhere, sensitive about their baby weight, loved Williams’ bold posts about the skintight outfit: “Catsuit anyone? For all the moms out there who had a tough recovery from pregnancy—here you go. If I can do it, so can you. Love you all! !,” she posted on Instagram. But most of all, women rolled their eyes at the basic message: Some guy telling a woman she can’t wear pants to work. But after being called unladylike, she took to the court in New York in tutus this week, in designs by Virgil Abloh from the Queen Collection, the result of a union between Nike and Abloh for Serena. Fans rejoiced. “Serena Williams is really out here taking down the patriarchy one tutu at a time,” tweeted one. “Not all heroes wear capes. Some wear a tutu,” said another. And Scary Mommy stepped right up and called her a goddess. It’s unlikely anything Serena Williams wears will have an effect on Nike sales, overall. “Tennis apparel in the U.S. is a very small business, so I do not expect any direct sales impact,” says Matt Powell, vice president and industry analyst for the NPD Group. But women’s apparel overall is a big deal, and while he tells Marketing Daily Nike is the largest brand for women’s sports clothing, Lululemon is in second place and gaining fast.